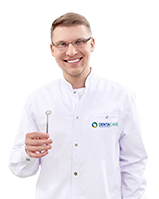 DentaCare / Advice / Anesthesia – dental treatments without pain! Dental treatments without pain? It is possible thanks to anesthesia! You can lie back in the dental chair calmly and fearlessly. The most frequently performed types of anesthesia include: surface anesthesia, infiltration anesthesia and conduction anesthesia. 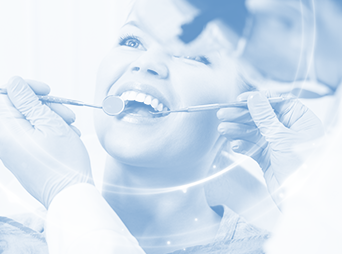 Before every dental procedure, the dentist conducts a detailed interview about the patient’s general state of health. 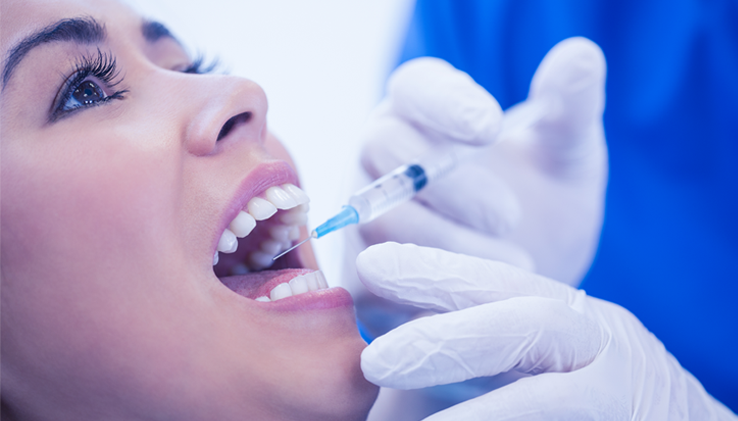 Based on the information collected, the dental surgeon chooses the right type of anesthesia. When treating caries, the most commonly used type of anesthesia is infiltration anesthesia. The dentist administers the anesthetic supraperiosteally, as close as possible to the tip of the anaesthetized tooth. Sounds painful? You will only feel a short prick. Nothing to be scared of! Individual teeth can also be anesthetized by administering an intraligamentary injection to the periosteum around the tooth. This technique involves small amounts of anesthetic, special syringes and ultra-thin needles. It may look scary, but it’s just a short prick. Conduction anesthesia is used during surgical procedures in the mandible (mainly molars and premolars). The anesthetic is deposited close to the trunk of the nerve. This type of anesthesia covers a larger treatment area. Sedation with nitrous oxide, also known as laughing gas, works well for children and people who literally get paralyzed at the sight of a dental chair. Who would have thought that a dental office can be such a fun place! This method is meant to calm patients. The patient’s face is covered with a mask, through which nitrous oxide and oxygen are administered. The patient, though wide awake, is feeling comfortable, relaxed and cheerful during the treatment! A computer-controlled system for administering anesthesia called The Wand STA is becoming more and more recognized and popular among patients. The method works well both for children and adults. Its advantage over the previously mentioned methods is the absence of unpleasant stiffness and numbness of the cheek after the procedure. Another big plus is that it works more quickly compared to the traditional methods and offers a lower risk of complications. In some cases, after the initial examination, the dentist may qualify the patient for surgery under general anesthesia. The patient is then completely unconscious and intubated as in other surgical procedures. This type of anesthesia is carried out by an anesthetic team (doctor and nurse), who are present throughout the treatment.